Engine Performance Enhancers keep your vehicle operating at its best. Need help figuring out what you need? That’s what we’re here for. Is your vehicle’s performance sluggish? Idling rough? Your fuel system may need cleaning. Let’s talk about your options. Plus, your fuel filter may need replacing. *Many auto manufacturers recommend getting a fuel system cleaning at regularly scheduled intervals. Check your owner’s manual for details. Streaks and smears on the windshield? In Canadian weather, it’s a common fact. Wipe away your inhibited vision with a quality blade replacement. Mud from off-roading. Salt and sand from winter roads. Spring blossoms, and autumn leaves. In Canada, all types of materials rain down on us. As part of your car maintenance go-to, ensure you have quality functioning windshield wiper blades, and have us replace them regularly. 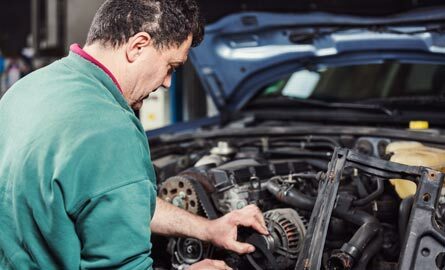 Keep components in your engine running well with a serpentine fan belt in good condition. Over time, it will wear and need replacement. These belts can wear and crack. They should be checked regularly for signs of deterioration and replaced immediately. Your Great Canadian Oil Change technicians can do this for you.